I gather up my courage and for the second time talk with my spiritual director about being overweight. “But it’s okay to hurt yourself?” she offers gently. I bite my lip and feel my heart pound. Once again I picture Jesus with compassion in his eyes, the way he was in the story of the woman caught in the act of adultery. This time he stands between my two selves. His back is to my false self (standing, arms crossed, scowling), while he gives my true self (sitting, barely making eye contact) space and a voice. I tell my director about my two selves. Among other things, she asks me how I feel about my false self. Now I knew why God was calling me to prayer. In the stillness, God exposes my false self and empowers the only me God created. And that me loves my body and longs to be heard. Take a moment and, with God, listen to your body. What does it need today? I am so grateful for fitness coaches like my daughter’s friend, Karina Inkster (left, Heidi on right). In high school Karina and Heidi challenged each other to care for their minds and bodies. They gave up television for a year and read classics. They refused to suntan and stopped eating animal products. To this day, they support each other in their choice to eat sustainably and care for their bodies. They also make great music together. Banner (not visible on home page) “Knit Together” by Kelly Dycavinu © 2011. Used with permission. 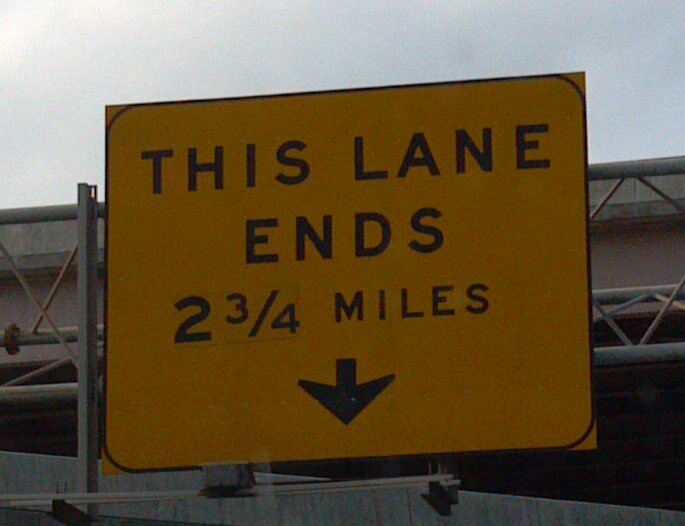 “This Lane Ends” courtesy of Best & Worst Ever Photo Blog. “Butterfly Resting ” (cropped) by D Wright. Used with permission. “The Cranky Molluscs” by Karina Inkster. Used with permission. This entry was posted in False Self, Lent, Overeating, Spiritual Direction, Stories and tagged A Book of Blessings, Best Worst Ever Photo Blog, Butterfly resting, Cranky Molluscs, D.Wright, Esther Hizsa, false self, Heidi Braacx, John O'Donahue, Karina Inkster, Kelly Dycavinu, Knit Together, Overeating, Richard Rohr, spiritual director Burnaby, spiritual director Vancouver, true self. Bookmark the permalink. Thanks, Esther. This post and the one about your previous conversation with Karen are particularly helpful to me today. I think this is a big one for a lot of people, including me. Your picture is much gentler than mine. Mine is like Gollum (who wants to follow the inclinations of the Ring) in Lord of the Rings when he goes back and forth between his 2 selves, the other being Schmeigel (who wants to do good)… but it’s time to hear God’s compassion over all of it and “discover the new direction your longing wants you to take” (J O’Donahue). Being kind to oneself as God would be, is way more empowering.